Was a very good day yeah, shame the weather turned a bit in the afternoon but certainly made things interesting. Yes it was a great end to the season - one of those weekends when the racing Gods were smiling and even the bad bits were good. This time last year I was gazing into a large hole in my engine, so quite a turnaround in 12 months. Congrats to all the Champions! A fantastic paddock atmosphere this year too. Full report later . . .
Out of interest, what did it weigh? 922kg with me (80kg) and half tank of fuel. I wasnt pushing like crazy, but certain aspects of the Mini are helping me go faster.... and some are causing me to make stupid errors (clarks). The driver has room for huge improvement, sadly a lack of sector times to see a theoretical best lap. Great to get back out in the car though! Sorry for the long post, but as there was such a big step forward this round, I thought that it would be worth a little more background to it all. The 17th of September had become an ominous date for me. I had put in for the day off 6 months ago, but approval was declined in August. It ended up as a bit of a showdown between me and my boss. I won the day, but the usual nervous excitement of the SLS weekend was replaced with more an angry �let�s get this done� approach. Feeling more tired and stressed than usual, the prep was minimal, but I did decide to change the oil. That heightened my anxiety further when a little more engine came out with the oil than I was expecting. Oil pressure was good, so I checked inside the filter, and under the microscope, it confirmed it was probably from the bores and rings. So I put it all to the back of my mind, and moved on. Arriving at KH on Sunday morning felt very different from previous events, but my mood made short work of getting the car ready. I went out for the warm-up without any expectations other than to check the car out and continue practicing of left foot braking. The sticky Kumhos had not been changed since the last SLS and the car felt good as I pushed a little. Now one of the changes I had to make with the 2.5L was to lower the engine, and that needed the front ride height raised. To cut a long story short, that promoted understeer and gives a less pointy car. My style up to this point (if I had such a thing) has been very much �point and squirt� by getting the car rotated quickly and on with the power as quickly as possible. The rapid onset of power with the 2L engine, and the short gearing, tended to require a skilled right foot, not only that, when it did let go, the rotating inertia was high, and that slowed the recovery. But the slower revving 2.5L couldn�t be more different: its flat torque, and long gearing, it just makes the throttle less critical, Controlling understeer with the throttle became a joy. Combine that with left foot braking, and you suddenly find there�s a degree of control that wasn�t there before. Anyway, back to the warm-up session. 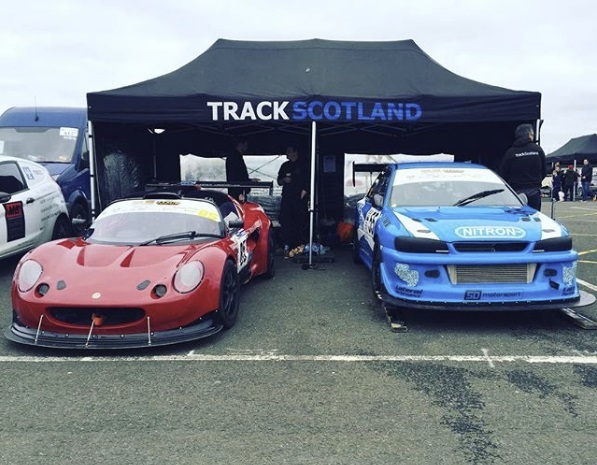 The car felt very good but I wasn�t seeing the times for the effort I seemed to be putting in. I kind of recognised that as a tyre issue and when I got back to the paddock, the rears looked very sorry for themselves. Not only were the pressures unusually high, but one had worn quite rapidly in the 12 laps. I had seen that before on the Kumhos � end of life self-destruct mode. Time to change, but I had to down-size, but took the opportunity to go to a soft, rather than the supper-soft, compound as track temperature looked like warming up. But with the fastest time in the session, the worn out tyres had done their job. Before practice, I had quick look at the Vbox data and compared it to the �Rory� lap. It confirmed what I already knew. I was chicken into Duffus and the Chicane. But I was still in the �let�s get this done� mood, so the task for next session was clear. The plan was to go for it on lap 3 or 4, cool tyres, and try again. On lap 3 I missed the apex at Duffus and I backed off. Lap 4 Duffus was better, MacIntyres was poor but I went for it at the chicane. The front went light on the apex and I decided to make a safe exit across the gravel. Having found the limits, lap 5 was better, and the Chicane, Clarks, and the Hairpin were all good. It gave a PB and 53.541 sec. 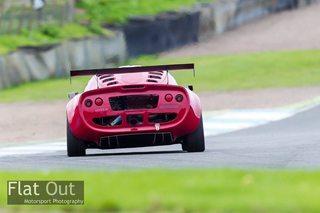 Some cooldown laps, then on lap 8 the Ultima brought out a yellow out at Duffus. Lap 9 was less edgy and a little cleaner and took a few tenth off my time to give another PB of 53.447, and the fasted time of the session again. Job done! Over lunch I looked at the data again and on lap 4, just before the �off� my delta was a 0.4 sec improvement on my best so far. So I knew there was a low 53 in there. I decided the soft compound tyres were working well and did not touch anything other than add a little fuel and top up the air for the gearbox. I then fell asleep in the van and missed the SLS meeting, but woke a little fresher and still very focused. At qualification I felt uneasy. I usually get my helmet on early and sit in the car and become quite relaxed. But not this time, I must have driven the whole session in my head. Adam�s car was in front, it seemed bigger and bluer than before. He switched his rain light on for a moment. That was a red flag to a bull, by now I was 100% for the moment, no distractions being allow to enter my head. I knew Adam would go for it on lap one, my plan was to warm up the tyres and brakes steadily and go for it when tyre were at their best � lap 3. It all worked a treat and I was little bemused at the PB of 53.278, but I felt I should go again, if nothing else just to use the track time. So lap 5 started quick but I hit traffic. By lap 7 it was clear the tyres were past their best and decided to call it a day. 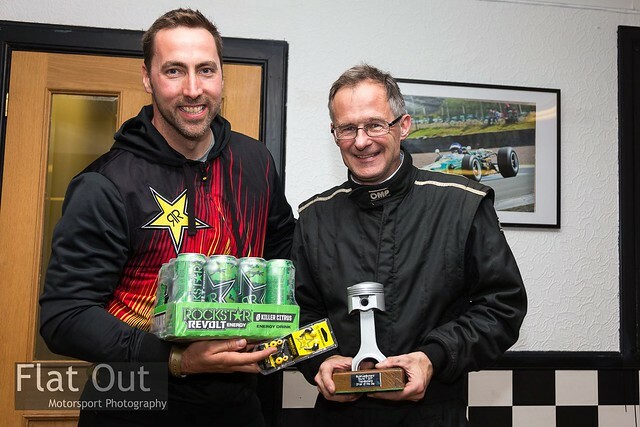 I was somewhat surprised to be P2 behind Colin Dorward by only four tenths, but delighted. A really intense downpour changed things completely for the final. Luckily I had qualified to run second last and over the qualifying session the rain stopped. It never dried out, but it did improve by Pro Class. I should have changed to my super soft �wets� but the thought of doing that in the rain did not appeal much. It was just a case of damage limitation, and I left the pit lane with the wheels spinning. I tried to be super aggressive without falling off on the out lap. The lap went Ok and there�s not much to say about it other than the low down torque of the 2.5 helped, short shifting works almost like traction control, I even got moments of full throttle. 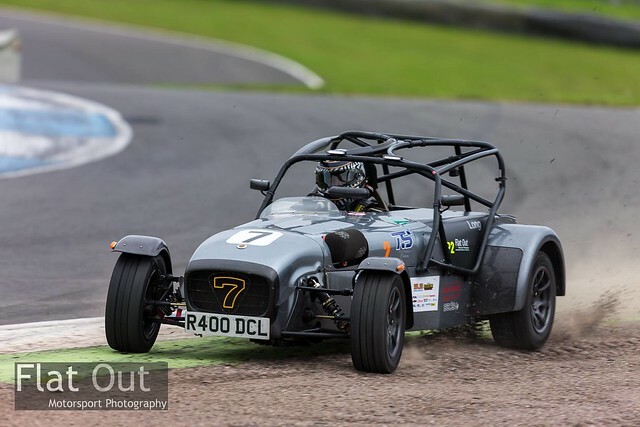 It gave seventh overall and second in Class, and the fastest Caterfield � that was good in the wet. Unfortunately the Vbox didn�t come online until the lap was over. So only the GoPro . 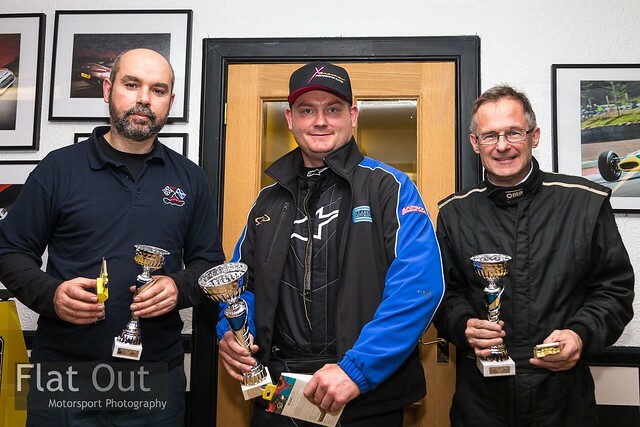 So with three second places, a third, and two fourths, I finished 2nd in the Pro Class Championship. That�s better than I expected - this was really just intended to be a development year for the car. But best of all I got the TrackScotland Driver of the Day. Turned up a bit late on Sat afternoon but Gordon & Renny hung around to get the car scrutineered - Thanks guys. Usual plan.... dominate. Set a good lap on my first lap of the day (low boost and oldest tyres) and sit in the pits and see how the session progresses. Plan was going well - first in the queue - clear track. Low boost with some button pushing to liven the straight up a little. Lap was a little scruffy but felt OK. Dash said 54.8 so was happy enough with that. Trundled round to the pits slowly letting brakes and tyres cool. Into pit and noticed a bit of smoke front the vents. Guys checked out it whilst I stayed in the car. 'Fire!' Oi Oi Oi... off with the belts and out of the car LOL. Simon put it out with a torque wrench so thankfully no damage through fire or foam/powder. 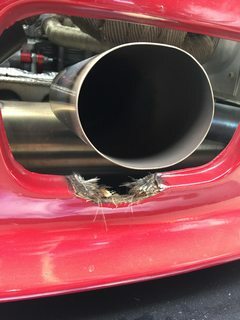 Traces of oil were igniting on the exhaust manifold wrap. Was happy enough to call it quits at that point and ended up 1st in class with a 54.8. Noticed B was quick and in general everyone was much more 'on it' than normal this early in the day! Back in the pits and the guys got to work. Matty checking logs whilst Simon (and Andrew) investigated the source of the oil/fire. Nothing immediately obvious was found so just a general clean up and back together. Second hand held extinguisher was fitted in car just in case I wasnt too worried as the fire only flashed up once the car stopped in pits. Last to go out in B having qualified first. No real advantage as all the other cars hadnt completed a lap so had no idea of times to beat or likely grip levels. Usual out lap (different to most folks!) and then on it. 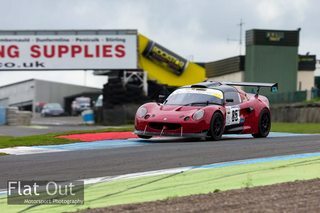 Car was a bit squirmy at the apex on Duffus but held decent speed down into McIntyres. Little bit of rear spin at partial throttle (so applied more to get rid of that ), bit tight at Butchers and more lairy that i'd have liked at Chicane exit. Clarks - here we go again. Not really sure what line I took... I'll call it a 'wet line' for lack of any clue or precision. Wide on to the slippy kerbs and this was the point that made the lap I think. Normally I'd have been a bit lighter on the throttle... but F*&% it.. hehe wiggle wiggle. Over the line with dash showing 58.8. No idea what that was worth but saw a few folk clapping on the way back round then Lisa giving the thumbs up Yeeha! 4secs clear of the rest of B and second overall but about 0.5 off Colin in Pro. I'll take that. Full points for the day, very little drama, 4 complete laps done and about 10l of fuel used LOL Perfect day if a little toasty at times. 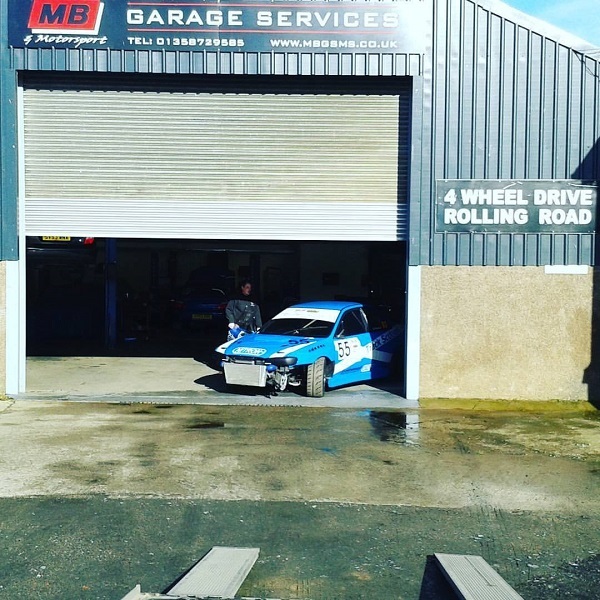 Thanks to Simon & Matty from MB Garage Services for the support. Fee for telling me to go slower (that seems to be the key... i have to sit in the holding area trying to convince myself not to push too hard, then try and reign in my brain to brake earlier or apply throttle less/later to keep traction). Thanks to Andy for the help, and Lowell/Davie for filling the other side of the TS garage. I have to say that the car is fantastic. So well balanced and neutral but willing to rotate on throttle when required. It sounds like a bag of spanners now (my changes from Fee's setup - all solid mounted) but its very agile and responsive. Who helped build the car? ... SD Motorsport, Lateral Performance, ZEN Performance, MB Garage Services, Nitron, Carbotech, Team Dynamics, Part-Box, Corbeau. Sponsors - None.... but I'd be willing to listen to serious offers if anyone wants to get involved with the car(s). David : Its a bloody bright rain light isnt it! Was in on flashing disco or just constant? Awesome result David, its days like that that make all the blood sweat and tears worthwhile! Well done, certainly got the knack of this sprint thing with one lap fliers! So my first SLS outing since I stuck it in the tyres at the first event of the year, a work rota that meant this was the only the third time out in the car, with the second spent struggling with splitter rigidity, to say I wasn�t expecting much would be an understatement. 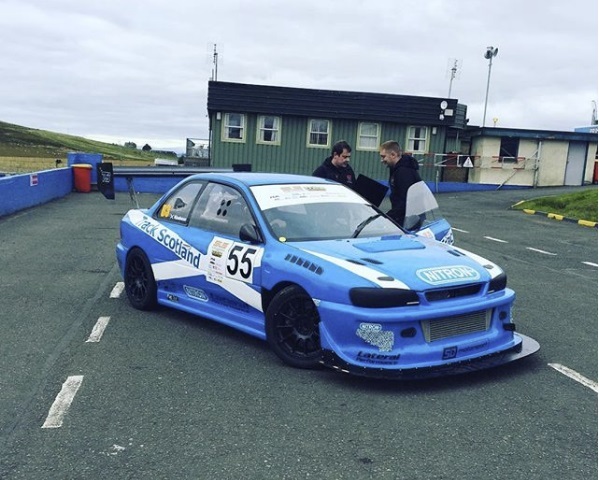 Also wound off the camber and toe�s all round to make the car a little friendlier, softened up all the damping to full medium I also decided to change pads to carbotech XP10�s after good experience previously, & the first session was spent bedding them in. 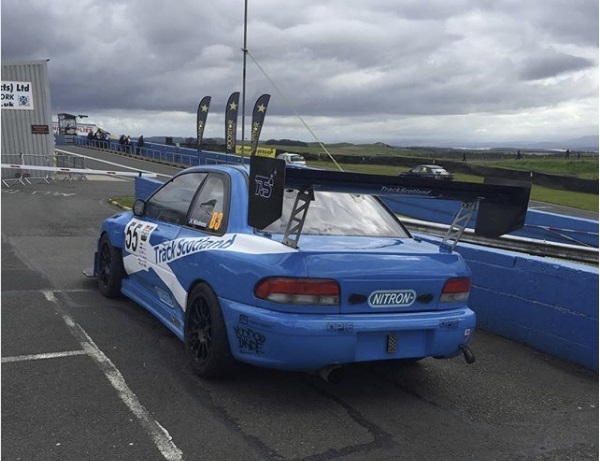 To my surprise I managed to get a 57 second lap, without ever putting together a full lap on it as such, car felt great, back end a bit loose but with the power and braking from big numbers twice on the lap that�s probably to be expected. Noticed an issue with the rear steady mount after the first run, and this was quickly nipped up but after the second session this had completely separated from the subframe, a lunchtime spent getting access to the knockhill garages (thanks to Duncan Vincent) and some great work from Davies Coutts with Matty & Simon from MB helping out got me back out after strengthening up the steady mount. Second session was down into the 56�s with again huge time to gain everywhere with some brave pills required, and not really putting a good lap together. Into qualifying and for the first time I was really bothered with traffic as whenever I was on a flying lap I caught someone on a cool down lap somewhere, the key is go out early and get a lap in ASAP. Especially as the tyres noticeably drop off after 6+ hard laps. 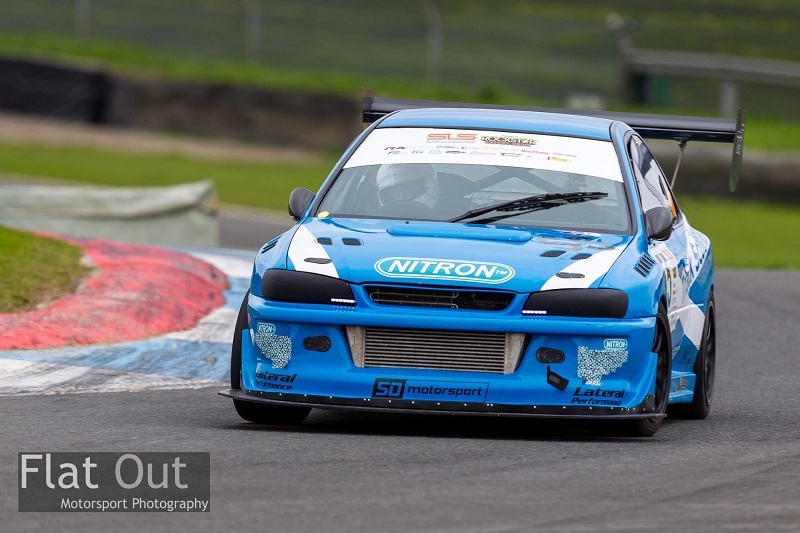 Nearing the end of the session and the time to go hard to try and get a decent time I lost all drive going from 4-5th on the main straight, gear indicator still showing ok but nothing would engage, I coasted up the escape road at the bottom of duffus and hopefully didn�t spoil anyone�s lap or the session. 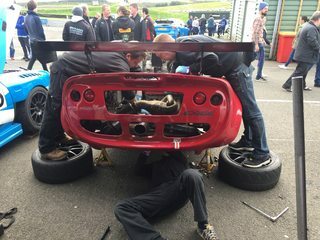 Whilst there was no nasty noises, smells etc it was suspected a LSD or clutch failure, or potentially a sheared driveshaft, getting the car up in the air back in the pits, the grumbling noises and lack of drive to both wheels confirmed it was game over for the day sadly. 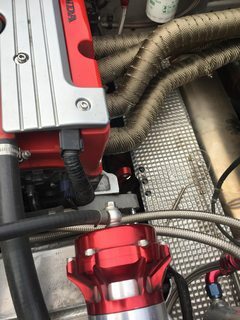 On further inspection it appears the NS Driveshaft was never fitted with the split ring and maybe 10mm lateral movement meant it popped out of the diff- a quaife gear type so all drive was lost. Annoying to end the day on something so trivial but a relief that everything didn�t need to come out as being transverse mid-engined the whole lot has be lifted out. It�s a �1.50 part which makes it even more galling, but great it isn�t more serious.